I recently sat down with Nguyen Tuan Son, co-founder and CEO of Kleii, a cloud storage service that launched just six months ago. He was proud to announce that within that time period, Kleii has already amassed 320,000 new users worldwide. This indicates a particularly fast growth rate as compared to Dropbox, which grew to four million users in 2010 in the two years since its launch in 2008. Today, Dropbox has over 100 million users but the global market is getting crowded with other consumer-oriented cloud services like Google Drive, SugarSync, iCloud, Box, Wuala, TeamDrive, and many more. Kleii is a Vietnam's answer to this wave of services. At Kleii’s current growth rate, it is getting five to six thousands sign-ups on average per day and is handling 4–5 terabytes of data per day. The basic freemium account gives 2GB, after which users will have the option to expand their online storage space. Nguyen: Most of us started working together at Kusto, an investment and management solutions company. Our current CFO, Yerlan Tasbulatov, was great with finances and I had an idea to come together to do cloud services. Most of our team came together from Kusto and we worked well together. In total, there’s now 11 of us. Nguyen (pictured): I think cloud services are still a growing global trend that will greatly impact our lives in the future. We wanted to compete globally because I think there’s still a lot of space for this market to grow, and although Dropbox has been dominant worldwide, there’s still a lot of space. 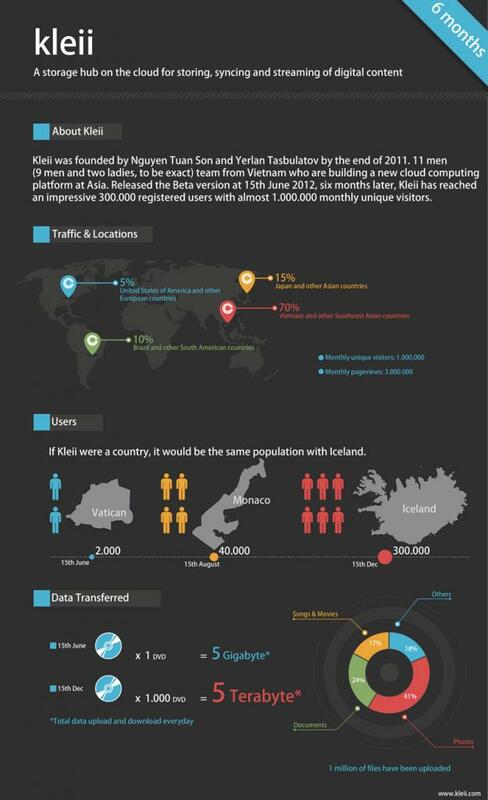 Dropbox penetration in Vietnam is still low thus the Vietnamese market is still new to the idea of cloud services. In fact, for many Vietnamese users, we are their first encounter with a cloud service, so we’ve had the privilege of educating our users. How did you get to 320,000 users in just six months? Nguyen: We didn’t spend any money on advertising or sales. In fact, most of the users that we got were totally unexpected. We spent most of our time on viral marketing. The drawback is that we have no idea where our users are coming from - by word of mouth or by our social media posts, we don’t know. Vietnam comprises 60 percent of our users but we’ve experienced a large growth in Japanese users and one of the people on our team had to translate our service in Japanese. It’s a good problem. Why haven’t you moved into cloud services for businesses, where the money supposedly is? Nguyen: First, there is a big market for consumers. Second, we wanted to solidify our brand name first. Third, our dream for Kleii is to be the network of content for families. We want to make it easy for our users to do personal streaming and personal multimedia. After we’re established in the core of what we want to do, we may look into business. But now we’re just looking at being the center of the families digital life. Soon, we’ll be looking at releasing a digital content store. 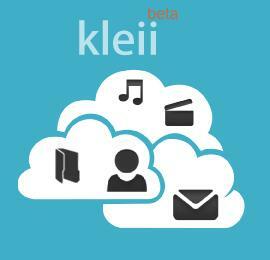 Our dream is that in five to ten years, everything in your digital life can happen and be stored on Kleii. Are you doing anything special for the Vietnamese market? Nguyen: We’re currently working on relationships with local telcos. We’d like to add Kleii on as a service that mobile telco clients can subscribe to it. It would be an added value for, say, a smartphone user to also get Kleii optimized with their 3G subscription. Especially since we’ve already released our HTML5 cloud services. At this point during the interview, Son whipped out his smartphone and played some music for me straight from Kleii. Two clicks and we were already listening to some Vietnamese pop. Neat. Why don’t you guys do mobile native apps for Android and iOS? Nguyen: We want to stick to building value for our users over spending too much on design. This has allowed us to focus on core aspects of our product. Nguyen: As I said before, we’re looking at the global market and adapting to our worldwide users. We already experienced a spike in our Japanese users but it looks like Brazil is accelerating so we will spend some of our energy in growing that large and potential market. Soon you’ll see Kleii in Portugese! For me, it’s really cool to see a Vietnamese company taking the global market seriously, something that I think is lacking in many startups here in Vietnam. The company is housed up in Binh Duong province, about an hour outside of Ho Chi Minh city in BTIC, a new large real estate project that aims to build a fresh Silicon Valley in Vietnam. Kleii is the first company to start there, and there’ll surely be more to come. The post Kleii, A Vietnamese Cloud Service Goes Global appeared first on Tech in Asia.